Team Edward or Team Jacob? Who Cares, It’s All DAUNTLESS, BABY! Yo, my Dauntless peeps are bringing their A-Game. Check out the awesome item we are giving away this week! Many thanks to Yara at Once Upon A Twilight for graciously helping our team out! Hello Dauntless fans! Today we have an incredible giveaway for you. The poster below is SIGNED by Robert Pattinson and Taylor Lautner. It came from the red carpet premiere of Breaking Dawn: Part 1. In addition to this fabulous prize, the winner will also receive an exclusive, limited edition Mockingjay pin from Comic Con! 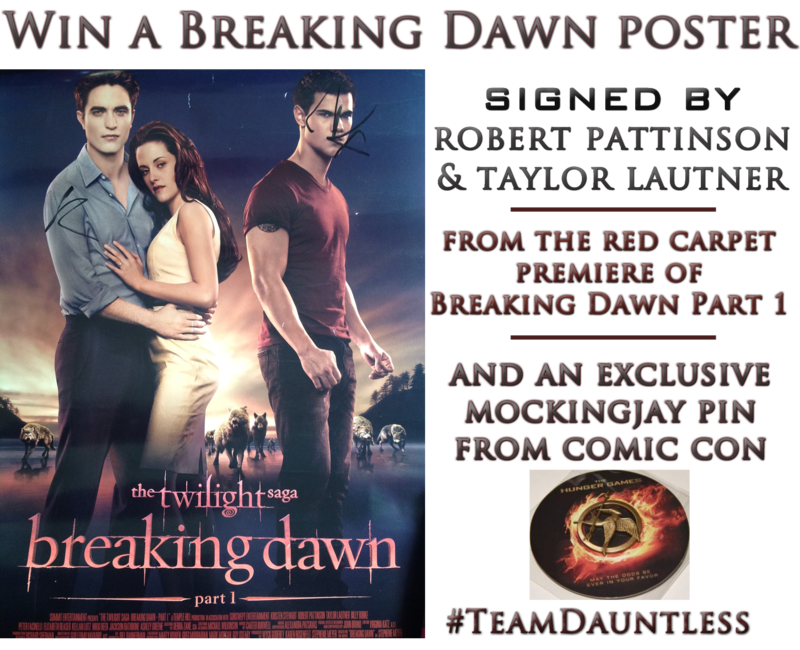 1 winner will receive a Breaking Dawn: Part 1 poster signed by Robert Pattinson and Taylor Lautner from the red carpet premiere and an exclusive Mockingjay pin from Comic con. Contest is International and ends April 30th. The rafflecopter form must be filled out to enter. Lots of extra entries possible. You can come back and enter each day! You can click the links below to support Team Dauntless and see the latest news from the faction. Visiting these 2 pages can be used as extra entries in the form! YOU CAN ENTER EACH DAY! Good luck and thanks again for helping spread the word about #TeamDauntless.